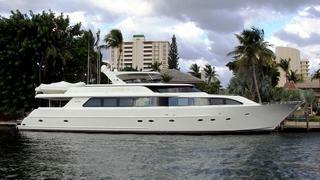 The 32.9 metre motor yacht Tahiti is sold with Bob Cury at RJC Yachts representing both buyer and seller. Built in GRP by US yard Westport to a design by Jack Sarin, she was delivered in 1998 as a Westport 108' model with exterior styling by Wesley Carr. The interior, designed by Sheryl McLaughlin, accommodates eight guests in a master suite, two doubles and a twin cabin – all with en suite bathroom facilities – plus crew quarters for four crew members. The main saloon has an open plan design with a formal dining area forward and there is also a dine-in galley. Exterior guest areas include a sun deck that hosts a bar, seating area and Jacuzzi. The aft deck is expansive and hosts al fresco dining for eight guests with amenities including comfortable seating for eight, a bar, fridge and a flat screen television. Additional large yacht options include Northern Lights generators, Naiad stabilisers, and a bow thruster. Tahiti is powered by twin MTU 1,525hp engines that achieve a top speed of 21 knots and cruising speed of 18 knots. At 12 knots she has a 2,500 nautical mile range.